When we assume that modern improvements are far superior to the practices of the ancients, we might do well to actually learn how people in the distant past lived before indulging in "chronological snobbery." Take, for example, the area of dental hygiene. We might imagine the ancient Greeks or Egyptians as prone to rampant tooth decay, lacking the benefits of packaged, branded toothpaste, silken ribbons of floss, astringent mouthwash, and ergonomic toothbrushes. But in fact, as toothpaste manufacturer Colgate points out, "the basic fundamentals" of toothbrush design "have not changed since the times of the Egyptians and Babylonians---a handle to grip, and a bristle-like feature with which to clean the teeth." And not only did ancient people use toothbrushes, but it is believed that "Egyptians… started using a paste to clean their teeth around 5000 BC," even before toothbrushes were invented. In 2003, curators at a Viennese museum discovered "the world's oldest-known formula for toothpaste," writes Irine Zoech in The Telegraph, "used more than 1,500 years before Colgate began marketing the first commercial brand in 1873." Dating from the 4th century AD, the Egyptian papyrus (not shown above), written in Greek, describes a "powder for white and perfect teeth" that, when mixed with saliva, makes a "clean tooth paste." The recipe is as follows, Zoech summarizes: "…one drachma of rock salt—measure equal to one hundredth of an ounce---two drachmas of mint, one drachma of dried iris flower and 20 grains of pepper, all of them crushed and mixed together." Zoech quotes Dentist Heinz Neuman, who remarked, "Nobody in the dental profession had any idea that such an advanced toothpaste formula of this antiquity existed." Having tried the ancient recipe at a dental conference in Austria, he found it "not unpleasant"
It was painful on my gums and made them bleed as well, but that's not a bad thing, and afterwards my mouth felt fresh and clean. I believe that this recipe would have been a big improvement on some of the soap toothpastes used much later. Discovered among "the largest collection of ancient Egyptian documents in the world," the document, says Hermann Harrauer, head of the papyrus collection as the National Library in Vienna, "was written by someone who's obviously had some medical knowledge, as he used abbreviations for medical terms." When we survey the dental remedies of Medieval England, we do indeed find that modern dental care is far better than much of what was available then. Most dental cures of the time, writes Trevor Anderson in a Nature article, "were based on herbal remedies, charms and amulets." For example, in the 1314 Rosa Anglica, writer John of Gaddesden reports, "some say that the beak of a magpie hung from the neck cures pain in the teeth." Another remedy involves sticking a needle into a "many footed worm which rolls up in a ball when you touch it." Touch the aching tooth with that roly-poly needle and "the pain will be erased." …take walnut shells well cleaned of the interior rind, which is green, and… rub the teeth three times a day, and when they have been well rubbed… wash the mouth with warm wine, and with salt mixed if desired. Another, more extravagant, recipe sounds impractical. Yet a third recipe gives us a luxury variety, its ingredients well out of reach of the average person. We are assured, however, that this formula "works the best." Whether any of these formulas would have worked at all, I cannot say, but they likely worked better than charms and amulets. 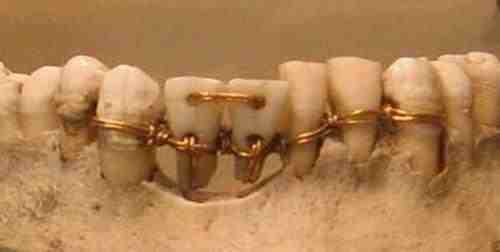 In any case, while medieval European texts tend to confirm certain of our ideas about poor dental hygiene of the past, it seems that the daily practices of more ancient peoples in Egypt and elsewhere might have been much more like our own than we would suspect. This “news” was in The Telegraph in January 2003…what’s going on? We weren’t presenting this as news. And we mentioned the Telegraph story twice. The bottom line is that we don’t subscribe to theory that just because an ancient recipe was mentioned in the press once, it can never be discussed again. not help full I hate it!!!!!!!!!! Ia actually have to say the final recipe for a tooth ache may have actually helped. Because even NOW in modern times if you buy the in-store tooth ache kits, the main ingredient in the “pain reliever” is actually clove as it has a numbing effect. as does the cinnamon. So, that last one would actually work on minor toothaches. Just throwing that out there. This jaw is not Egyptian! It is from Saida in Lebanon and on display at the American University in Beirut Museum. Your title needs attention. Fourth Century AD and 4th Century BC are not equivalent. That’s really great news! Always the ancient Egyptians surprises us with amazing secrets. The ancient Egyptian history was divided into 3 kingdoms. The Old Kingdom (2700 – 2200 BC): During this period the ancient pharaohs started building the pyramids. They started with Djoser step pyramid then they built the Great Pyramids of Giza, the pyramids of Khufu, Menkaura, and Khaefra. Amongst all the pyramids, the 481 feet pyramid of Khufu is the biggest. The ancient Egyptians used more than two millions of stone blocks, each weighting about two and half tons were used to build each of these Great Pyramids. The Middle Kingdom (2100 B.C. – 1800 B.C. ): During this period, the ancient Egyptians were buried inside the hidden tombs instead of the pyramids to keep their bodies and their treasures away from the eyes of the tombs robbers. The New Kingdom (1500 B.C. – 337 B.C. ): At the beginning of this period, the ancient Egyptians suffered from some invaders called the Hyksos but the Egyptian were able to win and kick them out of Egypt by the famous leader Ahmose. The New Kingdom is considered to be the Golden Era of the ancient Egyptian civilization. During the New Kingdom time, some of the great kings and queens ruled Egypt and created the history of the cradle of civilization lands such as Queen Hatshepsut, King Ramses II, King Tut, King Seti I and more.